I think I'm one of the rare people. I feel like I need to update my devices the second an update becomes available. Sometimes, I shoot myself in the foot, because updating to a brand new operating system (ie: iOS 10.3.2 to iOS 11.0), you often run into software glitches, as the new operating system hasn't been well-tested in the consumer environment. I do encourage supplemental updates, such as going from iOS 10.3.0 to iOS 10.3.2. These are all found in Settings > Software Update. As I normally do, I instantly updated to the new iOS, iOS 11.0. Glitchy at first, but it only took a few days for them to come out with the first supplemental update to iOS 11.1. So at this point, I would encourage consumers to update their phones. There are many reasons why I recommend updating, and it usually has to do with security and patching potential exploits. I did find with iOS 11, one new feature that I think was long overdue and a underrated function. This is the Emergency function. By pressing the Lock/Power button five times in succession, it will bring up the extended power-off screen (pictured left). 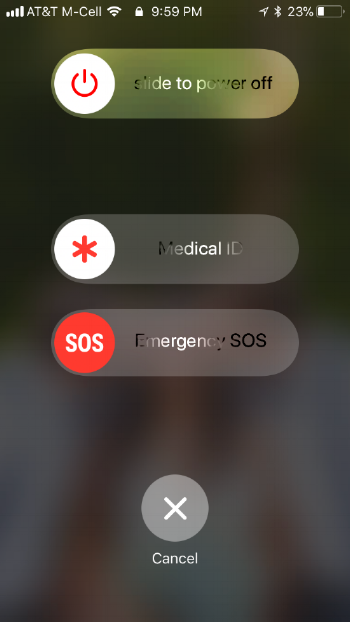 Instead of simply have the Slide to Power Off function, it now shows that you can swipe to view someone's Medical ID or make an Emergency SOS call. I think it is relatively easy to think of why this is so practical. This allows you to not HAVE to unlock your phone to call 9-1-1, and because Apple requires you to press the Lock/Power button five times, the chances of it happening inadvertently are slim to none. So hypothetically, let's say you encounter an emergency. You tap the Lock/Power button five times, bringing up the screen pictured left, and now you swipe the Emergency SOS across to the left. So what happens next? First thing the occurs, is a call to 9-1-1. It's pretty straight forward. It will call emergency services for you. It will also leave the End Call option up on the screen, so heaven forbid you did accidentally press the Lock/Power button five times, you can quickly end the call before it connects you to emergency services. This isn't, however, all that happens when you use the Emergency SOS function. There is one more newer function that I find ingenious. After the 9-1-1 call is over and/or the call is ended, it reaches out to your emergency contact. 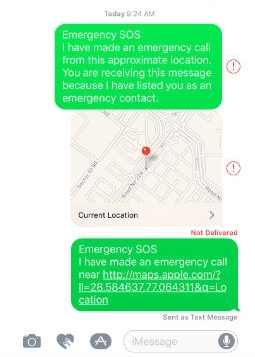 To set an emergency contact, simply go to Settings > Emergency SOS, and halfway down the page, it will show your emergency contacts, which you can edit at will. At this point, a ten second countdown will begin. 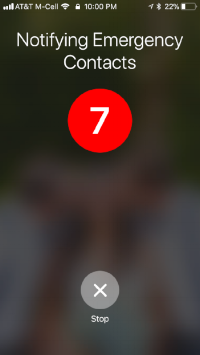 After your ten second countdown expires, it will automatically send a text message to your emergency contacts, of which you can have multiple. This message will send your contacts a short text message, as well as send them your current location. That way, not only will the authorities be notified by your 9-1-1 call, but your emergency contacts can as well. This text and location information (shown below to the left) will allow your contacts to click on your location, which will open the Apple Maps application, and you can, in turn, get directions to that exact location. Although this is a small, new function, I think it was a great idea by Apple to have a function that will auto-text emergency contacts. That had the Emergency SOS option for the Apple Watch, but it was about time we saw it on the iPhone. I would highly recommend updating to iOS 11.1. Before you do, however, make sure you run a backup of your iPhone, preferably an encrypted backup to iTunes, as it will retain the most amount of information. Cheers!